What is utilitarian interior design and where and when did it start? 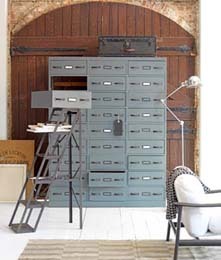 Utilitarian style in interiors was born in the loft apartments carved out of old warehouses in New York in the 1970s. Priced out of affordable accommodation in traditional housing in Manhattan, people looking for large, light-filled spaces gravitated to areas which had once been (and still are, in some cases) warehousing for fabrics, clothing, food and other commercial goods. These cavernous spaces made no concession to the comforts, or even the basics, of residential living. These were industrial interiors, with steel beams, brick walls, concrete floors, and metal-framed windows. Rather than strip out these muscular elements, the new inhabitants - many of them artists, musicians, writers and designers with more flair than cash - worked with these features, incorporating them into their new homes. Utilitarian style was born. The key elements of utilitarian style are function, edginess and unpretentiousness. Key materials are metal, concrete, wood, iron and brick. Fabrics are natural - cotton, hessian, linen, wool, leather and parachute silk. Large expanses of wall are perfect for showing contemporary art, and the large floor areas invite area rugs - a mix of contemporary designs with old Persian and Moroccan Beni Ourain rugs. Why is utilitarian interior design such a popular trend at the moment? Utilitarian style is currently popular because more people are buying properties in buildings that were once warehouses, pubs or other commercial spaces. The utilitarian style works particularly well in large, open spaces with a bit of an industrial feel. So how can one keep their utilitarian space looking homely? It's important to incorporate comfort into a utilitarian style. You may have a grafitti image on the carpet, but make sure the carpet is plush! Put up custom-sized industrial landscape wallcoverings next to brick walls or concrete flooring for some graphic colour. Dress the big warehouse windows with some full-length silk curtains. The trick is to add tactile comfort with a utilitarian edge in the design. What are the advantages of this look? It is clean-lined, edgy, modern and spare. It's a clutter-free look - you build in handleless cupboards to store away your stuff or bring in locker style cupboards for a street-wise element. It's perfect for the bachelor, the couple and for the young family (lots of room to run around the flat!). I've even known a couple who regularly roller-skated around their industrial flat. Is it a low maintenance décor or it a style that requires a particularly fastidious person? It's a very low maintenance design - floors are normally wood, tile, concrete or poured resin, so are easy to keep clean. Area rugs are important to soften the edges of the look. The key is to keep clutter hidden away in clean-lined storage. Is it a look that only really works in modern spaces or is it something that can work in period properties? Of course it works perfectly in warehouse properties. However, you can still bring elements of the utilitarian look into period properties. Stream-lined sectional sofas and modern lighting look great with an old Persian carpet, modern art and original architectural features like a marble fireplace and original cornices. It's a matter of balancing the elements. The juxtaposition of the utilitarian design style with the period can highlight the best elements of both by their contrast to each other. Which rooms does a utilitarian style work best in and why? Utilitarian interior design works best in open plan living/dining/kitchen rooms, cinema rooms, large family rooms and stream-lined bedrooms. Good light, both natural and electric, is vital for the look to work, and a larger space is an advantage. The look is a bit "muscular" and although it doesn't usually involve having a lot of furniture, what you do have needs space to breathe, as it tends to be quite bold and graphic. How can one keep the utilitarian style interesting? Keep the utilitarian look interesting by layering textures - leather and chrome furniture with long silk curtains, big pieces of colourful art, textural or graphic feature walls, decorative accent lighting along with hidden accent lighting and plush area rugs - either modern or antique Persian rugs. Mix the edgy newer items with some distressed older items - I love the mix of very modern dining chairs around a rustic oak farmhouse table, or a modern leather sofa with an old Persian or Beni Ourain Moroccan rug. What wall colors work best with a utilitarian look and why? I always find white a great wall colour for the utilitarian interior, particularly if you bring in some accent walls in concrete grey (possibly in a polished plaster), deep red, a graphic wallpaper or mural, or a tiled wall. White walls provide a great background for large pieces of modern art. What are the top three suggestions for statement utilitarian pieces? Top three utilitarian pieces: a large sectional sofa, a large statement area rug (either modern or Persian or Moroccan) and some big pieces of art or a graphic feature wall. What are the three biggest misconceptions about this look? The 3 biggest misconceptions about this look are that: it's cold, it's too masculine, it's impossible to incorporate into a period property.